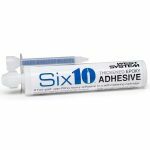 West System Six10 Epoxy Adhesive - Goosebay Sawmill and Lumber, Inc.
Six10® Thickened Epoxy Adhesive combines the strength and reliability and excellent physical properties of a two-part WEST SYSTEM Epoxy with point-and-shoot convenience. The self-metering coaxial cartridge dispenses a gap-filling structural epoxy that bonds tenaciously to wood, metals, fiberglass and concrete. The tube comes with a static mixer that lets you lay down a bead of thickened epoxy with any standard caulking gun. Each tube of Six10 comes equipped with a static mixing wand. Additional static mixing wands are available.